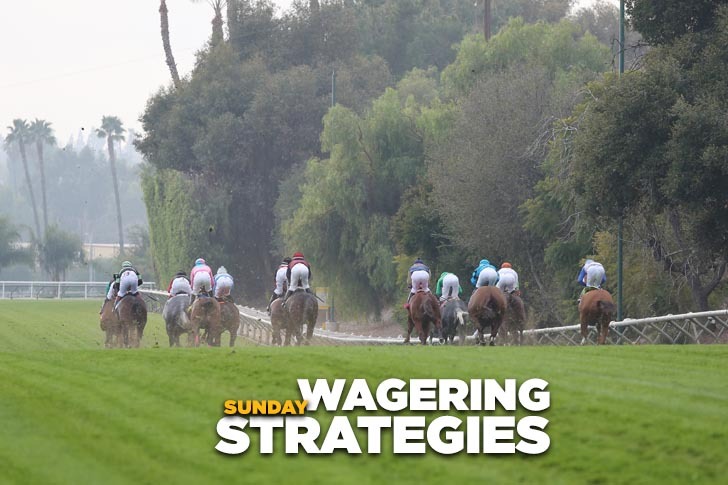 Forecast: This wide-open grass grab bag for first-level state-bred runners requires a spread; we’ve listed four main contenders, but best advice is to include as many as you can afford to. Full discloser: this handicapper is part owner of Brave Helios, so we’ll pick him on top at 12-1 on the morning line, though to be sure the extreme outside post could make things difficult. The son of Artie Schiller returns off an 11-month layoff but is training up north like he’s fit and read, and he did break his maiden at this trip on turf as a 2-year-old. Lostintranzlation is a filly tackling the boys and has been away almost a year, but the works at San Luis Rey Downs catch the eye and she lands Rosario. Look for her to be on or near the lead. The Street Fighter exits a much tougher race, and a repeat of his race before could be good enough. Jet Set Ruler is a first-time gelding and on that angle alone he’s worth tossing in. Forecast: Don’t Stalk Me returns to his winning level and should snap back to good form for O’Neill. A winner of four of seven starts over the local main track, the Kafwain gelding will need to avoid trouble from the rail but with clear sailing he seems capable of producing the last run. Conquest Cobra is a first-off-the-claim play for Sadler and should be tough from his cozy outside draw. He has a good stalking style and should be bearing down in the final furlong. We’ll try to get by using just these two in our rolling exotics, with preference on top to Don’t Stalk Me. Forecast: ​According to her rising speed figures, Withholding Info is improving with racing and the Baffert-trained filly should justify her morning line of 6/5 in this first-level allowance main track miler for fillies and mares. The daughter of Midnight Lute out of the top race mare Executive Privilege catches a field without much early speed and projects to be within striking range throughout. In a below par field, she looks like a no-value, rolling exotic single in a race that we’ll otherwise pass. Forecast: Guiliana makes her U.S. debut in a first-level allowance nine-furlong turf affair and should completely outclass the competition. Stakes-placed on several occasions in good company in France, the Powell-trained mare gets Prat and Lasix and sports a work tab that should have her plenty fit for a major effort in her first outing since November. At 3-1 on the morning line, she’s a straight play and rolling exotic single. Forecast: Baffert holds the aces in this first-level allowance sprint with both Soul Streit and There and Back strong contenders. ‘Streit kept on nicely to be second in a similar spot earlier this meeting in his first start since a summer campaign as a 2-year-old and seems very likely to produce a significant forward move off that effort. ‘Back won his debut last summer here with a powerful speed figure but then disappeared. He’s trained like he’ll return as well as he left. We’ll give Soul Streit a very slight edge on top but use both in our rolling exotics. Forecast: ​Jack’s a Diva makes his first start since being claimed at this level by Sadler and really won’t have to improve much to graduate. A healthy work tab since raced and the presence of Rosario in the saddle assures the Florida-bred colt to be strongly supported on the tote. John’s Intuition has displayed some ability in three starts and today shows up as a first-time gelding. His debut run on New Year’s Eve – a sharp second in a tougher spot – charts very well here. We’ll put Jack’s a Diva on stop but use both in our rolling exotics. Forecast: Sejo took the overland route in his U.S. debut in the San Marcos S.-G2 in February and under the circumstances wasn’t beaten all that badly while very likely in need of the outing. With that bit of experience behind him coupled with this significant drop to the second-level allowance category, the Irish-bred colt should be primed for a big try at 4-1 on the morning line. Souter has won two of his last three with rising numbers, and with another forward move today the Glatt-trained gelding will be in the fray once again. Conquest Lemonraid is a dangerous Woodbine invader from the Miller barn with a sharp work tab at San Luis Rey Downs to indicate fitness. He lands Rosario, so we’ll toss him in despite his lack of success (so far) on grass. Forecast: Dream Tree has trained like her old self since stopping badly as the odds-on favorite in the La Brea S.-G1 in late December and anything close to her best effort will beat this field. The daughter of Uncle Mo catches a field without much speed and could find herself on the lead, though she’s just as comfortable in a stalking position. She’ll be too short to play in the straight pool, but we can use her as a rolling exotic single. Forecast: We’ll double the nightcap, a maiden $50,000 claimer over a mile on grass. Holy Ghost returned off a nine-month layoff to rally late and finish third in a similar spot and with even a slight forward move today will be make him double tough. We’ll put him on top. Indoctrination, away since last August when he was strong second at this level at Del Mar, lands Prat for a barn that has good stats with layoff runners and has several back numbers that are good enough to win in this league.